Whether you suffer from pain caused by Arthritis or an injury, get some relief with this therapeutic Magnetic Support System. You can speed up healing of the injured area and allow daily activities to continue. The support naturally warms the affected area to improve circulation. Feel relief from your arthritis or injury pain with this easy to use support. You can put on and take it off easily and it stretches to allow normal motions. The Controlled Magnetic fields have been shown to improve circulation. And one size fits all, with an easily adjusted hook and loop closure. This is a non-medical method for the treatment of pain. Magnetic products may interfere with pacemakers. If you use a pacemaker or suffer from an injury or an ailment consult your physician before buying this or any magnetic product. This product should never be used as a replacement for professional medical treatment. SIZING: Fits chest sizes 37" - 45". MAGNETIC THERAPY FOR PAIN: Deep penetrating magnet therapy has been shown to to help relieve sprains, strains, arthritis, or general aches and pains. FASTER HEALING: Controlled magnetic fields have been shown to enhance the body's natural healing process, improving recovery times. ULTIMATE COMFORT: Stretchable and terry-lined to reduce moisture build up and improve comfort. Washable. Reusable. One size fits most. 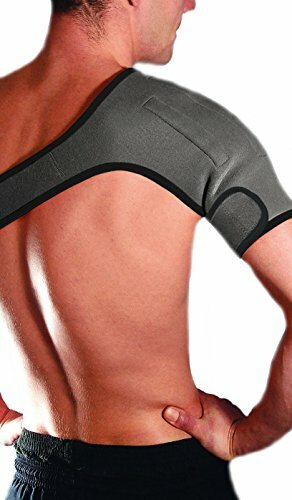 HEAT THERAPY: Highest quality neoprene construction naturally warms the shoulder area, increasing circulation to help provide soothing relief. If you have any questions about this product by PolyGel, contact us by completing and submitting the form below. If you are looking for a specif part number, please include it with your message.